Anything will work if you let it. 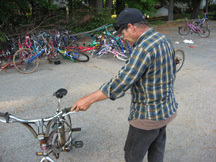 I ran into Lowell a couple of days ago down at the HIVE where he was helping out with the BikeMe! open hours. Lowell knows bikes; when he came to Greensboro three years ago he brought with him the bicycle he had bought in Artesia, New Mexico in 1983—he would still be riding that bike today if it hadn’t been demolished when a car ran into him last year. He came to Greensboro in the spring of 2005 with the bike, some clothes, and a guy who skipped town shortly after he dropped Lowell off in a patch of woods near the Coliseum. That’s where Lowell lived for the first summer and winter, in a makeshift shelter of plywood and shingles. After the police started coming around too often, he moved further out—“further out” is the only address I have for him, and the only address I want to have—and that’s where he’s been ever since. I had asked Lowell a couple of months ago if I could interview him for this blog, and he had told me to go ahead and tell him when I was ready. With all that’s happening at the HIVE and Food Not Bombs—Lowell is deeply involved in both—and with all the talk in Greensboro about the need for a day center, this seemed like a good time to write some more about homelessness. I told Lowell I wanted to share some of his ingenious survival tactics. “How about thrival tactics,” I said. We made an arrangement to meet early at Food Not Bombs to talk. The weather on Tuesday was lovely. There must be a term in poetics or in physics for the feeling it gave me, for the strange way certain kinds of light can rearrange chronology. The clear, warm afternoon sunlight that filled the high-ceilinged room at St. Mary’s House belonged to a sequence of early summer afternoons that stretch all the way back to those first breathless days of summer vacation. It could have been 1958 or 1978 or last year; it could have been New Hampshire or Massachusetts or North Carolina. It had a floating, expansive quality that disengaged the day from Monday and Wednesday and strung it on a longer and more tender string. Danny came over with a plastic bag full of peppers and tomatoes from the kitchen—we encourage people to come into the kitchen and take whatever food isn’t going into that night’s meal. “You know what that means,” he said, hoisting the bag. “A pot of beans.” Danny is one of the people participating in the new Housing First program—he’s living in his own apartment again for the first time in a couple of years. He sat down on the other sofa. “Where does the canned food come from?” I asked Lowell. “Sometimes the dumpster, sometimes a food pantry,” he said. Mike sat down next to Danny. “They’re afraid you’ll sell it,” he said. “There’s not a limit on overnight bags,” Mike said. “How do you open the can?” I said. “P38,” Lowell and Danny said at the same time. Danny reached into his pocket and pulled out a small flat piece of metal about the size of a razor blade. “Army can opener,” he said. Lowell shrugged. “A woodsman’s machete would be nice,” he l said. “It would make it easier to clean raccoons.” Mike made a face and shifted on the sofa. He’s from Brooklyn. “It’s hard to clean a raccoon with something this size,” Lowell went on, holding the diminutive Swiss Army knife on the flat of his palm. “Why do you carry such a small knife?” I asked. “That’s usually just long enough,” Lowell said. “Do you do anything with the skin?” I had a brief internal picture of Lowell sitting cross-legged in the woods stitching himself a raccoon-skin comforter. “I eat out of people’s garbage cans,” I said. “Not the kind of garbage cans I’m talking about,” Lowell said. The smells coming out of the kitchen were growing richer and deeper, filling the space with sonorous tones of garlic and onion. We had been given a couple of bags of potatoes and Morris was deep frying them—big meaty wedges dusted with chili powder and sea salt. He brought out some of the first batch and passed them around; crisp and hot to the touch on the outside, cool and yielding on the inside. “What do you mean by enemies?” I said. Like all homeless people Lowell gets stopped a lot by the police when he’s walking or riding his bike or even just sitting; it infuriates him. “Do you mean the government? The police? But it was six o’clock. There was a rustling at the other end of the room as people lined up next to the tables that had been set up with stir-fried vegetables and fruit and bread and Morris’s deep-fried potatoes. The sun was level now through the windows, glinting off the water pitcher and the forks and the stack of china plates. I wasn’t staying that night to eat, but I did take another one of Morris’s potatoes. People were eating, sitting and talking and eating, as I closed the door behind me. We’re holding our first formal meeting next week about the next version of our collective—the first meeting, at least, that isn’t a chance conversation in the kitchen or an open-ended daydreaming session after the weekly house meeting. We’ll be sitting down with Ed, Marnie and Muktha, all of them connected through the Fund for Democratic Communities and through Cakalak Thunder, and all of whom have expressed an interest in helping whatever it is that we have started here grow and change into whatever it is that it is next meant to be. In the middle of the back-and-forth emails scheduling that meeting, Muktha sent this lovely piece of writing to Mark, who passed it on to me. It’s a reflection on her childhood on the southeast coast of India that she wrote for Mother’s Day—“many of those memories,” she explained to Mark “were triggered by our conversations recently about conservation and community.” Many thanks to Muktha for letting me reprint it here. I can’t think of childhood, and therefore who I am today, without Amma at every turn. She is like those gifted actors who play 15 different roles in one play, and the difficulty is in separating those identities of Amma. For this year, maybe I should focus on the ‘green’ Amma – the person who gardened with a passion, who conserved beyond measure, who was creative in every move of conservation, and played a fierce role in animal husbandry that would put any environmentalist to shame today. The beauty of it all is that every role, every task, every initiative was so integrated into her role of mother and she carried them all out without a book, magazine, website, organization, cooperative, forum, collective, or trust. It was the way she thought and lived as she raised a family, including an extended one. And of course, she didn’t do this alone. Family, relatives, gardeners, neighbors, and children all pitched in. Although I didn’t know it at the time, I was learning about reclaiming water as soon as I woke up. As I got a tumbler of water from the kitchen faucet and in the typical playfulness of a child let it flow over and all over my hands, the excess water drained through the pipe below and out into the garden. Carefully laid out pipes sucked every drop of waste water from the home that was organic and biodegradable into the garden, and the garden itself was no blank plot of cultivated land. The entire garden was made of numerous clusters of small plots that were home to a bunch of banana trees, green beans, eggplants, jasmine flowers, roses, lime trees, papaya trees, coconut trees, peppers, tomatoes, and all kinds of greens, ginger and garlic. And here I should pause to specify the most valid argument for Amma’s green gifts. In 1970, when we moved to our new home along the beach, the brand new 3-bedroom home sat on loose beautiful sand. If we dug a foot, we saw water seep in at the bottom. In 1977, when my father died suddenly and the family was uprooted from there, we left the home surrounded by a modest lawn with lilies, zarbeerahs, and evergreens on one side, dwarf coconut trees in one corner, a rose and jasmine garden on another side, a full fledged edible green vegetable garden on another, and numerous fruit trees in the backyard. Amma was the alchemist who turned the sand into food. My own favorite was the banana garden. Perhaps it was that the wastewater flowed into that patch first, or perhaps it was because of the ‘holy’ aura around the banana world in Hindu homes, but that patch was the most vibrant, dynamic, colorful, and sweet patch of yard that I remember. Like Amma’s love, it was tender, 100% accepting, forgiving, and always welcoming. incense holder. Come to think of it, I don’t remember but one stainless steel lotus-shaped incense holder at home in the Pooja(prayer) room, but incense-lighting was a common and everyday task. Since the windows and doors were wide open during the day, the smoke from the incense never really collected in the home. We kids often heard an adult yell for a banana after a bunch of sandalwood or rose incense was lit, and they were easy to find on the initialed rectangular stainless steel plate that sat on the dining table. You grabbed one and scurried to the adult, who gently stuck the bottom of the incense sticks through the yielding banana skin. As I said, when I washed my hands in the kitchen sink, the water didn’t drain down into a black hole and disappear. Well, it did just for a second before it splashed out on the other side of the kitchen wall and into the beginning of a complicated maze of trenches that reached every fruit tree and vegetable patch in the backyard. Sometime after the home was built and the plumbing was in place, Amma decided that the plumbing must be altered in order to serve the garden in the backyard. Water is precious in tropical contexts, and it must not have made sense to her to let all that water drain into a black hole. The first stop for any water from the kitchen was the little banana grove about 6 feet from the kitchen. You see, banana trees are like families. There are several shapes and sizes all the way from the tall and tired grandpa banana tree to the lush little baby at grandpa’s feet, and they all huddle together to claim a crowded green outline against the blue sky. Maybe because the cycle of life was so lucidly transparent in our own backyard, or maybe because I still begin my day with a banana, I am quite fond of those memories. The banana stem is like a smooth pale green pillar, tall and upright, and can grow up to 10 or 12 feet. From the top of each of those green pillars, numerous long leaves would grow up and out and hang all around the stem. From somewhere in the middle of those leaves, a chalky fat maroon casing would grow out and hold numerous little bright yellow banana flowers within each fold. The closest it comes to is an artichoke, but in different colors. Each maroon casing would curl up to reveal a soft and deep-maroon underside that had just protected the tiny flowers. Thus would start a magical cycle of the life of the huge and hanging cluster of bananas. There wasn’t a part of the banana tree that went unused. The outer casing of the stem would dry out like an onion skin, but lent itself to being torn into long and slender threads that would be wetted to string beautiful jasmine garlands for the pooja room. The fruit was everyday food. The juice from the corm of the banana was used as medicine; so were the bitter flowers. My favorite part of the plant was the leaf. It was about 5 feet long with a sturdy spine in the middle and a smooth but ribbed leaf about 10-12 inches on either side of the spine. I can’t possibly describe all the ways in which I’ve seen this leaf used. During the relentless monsoons, I saw two leaves double up as an umbrella for the poor. During unannounced visits from rather large families, they served as plates. Cut in threes, the leaf served as a beautiful plate on which the various foods were served in an elegant style. And this was no accidental plate. There were prescriptions about how the waterproof leaf was to be placed on the table, how it should be opened, which end faced which direction, and how it was to be closed as a sign that the person was indeed done with the meal. The best part, again, came at the end. Of course, there were no dishes to wash, just leaves to be thrown away, and yes, eaten again. This time, the milk cow from the neighborhood would be led to the bin for organic waste that held the after-party plates, and would make a meal out of the banana leaves. I can go on and on about integrated, deeply meaningful, funny, loving, even tragic experiences from my childhood, but the point is that they all taught me something about life that was sustaining, beautiful, joyful, and completely with value. Much of everything I know now, I learned from those spaces that were fashioned by Amma’s creativity, frugality, love for nature, especially water, and love for all of us around her. I know now that I first encountered the idea of ‘craft technology,’ one of many of Gandhi-concepts, at home through Amma’s (mother) handwork. I didn’t hear the words until I became an adult or discuss the concept until I was transported to an American classroom, but I was well educated about how it worked. According to Gandhi, technology must always serve the human, and humanity’s right to freedom and democracy. It must be engaged in the protection of livelihoods, and to conserve the environment. It is only in a decentralized democracy where life, livelihood, and environment are protected that craft technologies can thrive. Craft technologies use resources wisely and there’s a sort of multiplied and multiple use of everything. Every time I hear about cell phones and their tie to traffic deaths, the dangers to human health as a result of sophisticated food technologies, TV watching and obesity, Net-addictions, impersonal and inaccurate medical technologies, and the numerous other signs that our technologies have failed to serve our needs, I make that mind-trip back home to Chennai in the 60s and the 70s to the home and life where Amma designed our technologies to serve us. This kind of greenness, this wisdom, this interconnectedness, affected everything we did. A side effect of this kind of lifestyle is thecomplete lack of competition, I now realize. She raised my brother and sister and I (and even the cousins) to co-exist, to cooperate, and to live in love and laughter. She made the simple things matter to us. Pete Seeger’s ‘One Grain of Sand’ is a favorite lullaby of mine, but I can tell it has quite a different meaning, thanks to Amma. 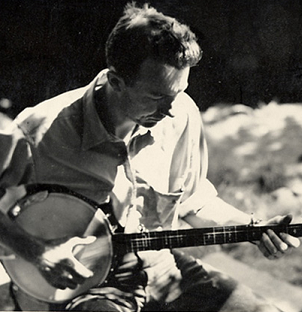 You can go here to listen to a snippet of Pete Seeger singing that lovely song. Down the road not taken there exists a weekly HBO ensemble drama called Anarchy! It’s set in some Midwestern city—Minneapolis perhaps, or maybe St. Louis. It’s about an odd household of people living together in an old house in a respectable middle-class neighborhood: a divorced woman in her 50s, a couple of punk kids, a mother and her young son, a musician/inventor, a bike fanatic. They spend their days doing things that any family does—talking, laughing, arguing, eating dinner, hanging the laundry out to dry—but they are not a family in the conventional nuclear sense. They are a collective house of avowed anarchists. Every episode begins at the weekly meeting where the house members gather in the living room to discuss what’s going on in their lives and to make decisions about what happens next in the house. Over the course of the season viewers watch the anarchists scavenge local grocery store dumpsters for food; follow one of the members as she is arrested and tried for anti-war activities; observe a punk band unravel and finally disband; enjoy the appearance of various odd visitors—played by guest stars like Kelly Osbourne and Jake Busey–who hitchhike or hop freight trains into town. The show is a mix of comedy (the ongoing struggle between the rats and the animal rights activist) and drama (episodes deal with real-life issues such as childhood abuse and racism). The show has never been a blockbuster, but it has gained a devoted following that gives it almost cult status. Two years ago I published an article about our collective house in The New York Times. In the days after the article came out we had all kinds of calls and emails from old friends, from literary agents, from random strangers and—most thrillingly—from a couple of TV producers who pressed us hard to let them option the story for a Six Feet Under-style HBO drama they called Anarchy! They promised us that it would no longer be our house by the time it made it to the screen—they would change the details of where we lived, would merge characters, would invent situations, but they would assign a couple of writers to live with us for awhile so they could get the overall flavor right. It never got that far: we only had to discuss it once at house meeting to discover that several of the housemates, most especially Stef, were so opposed to the idea that they could not imagine budging. That’s the way consensus works—unless everyone can agree to a course of action the decision is blocked. In this case, no one was deeply enough in favor of the TV show to argue the other side. After a brief discussion I was deputized to email the producers back and tell them “no”. It’s too bad in a way. In the last couple of weeks I’ve found myself thinking that if this were Anarchy! our ratings would be going through the roof right now. To start with, Jodi’s pregnant—she and Mark are expecting a baby in November. After living as housemates for three years, and then collaborating in the band Invisible, they developed deeper feelings and began a quiet relationship. Lucky baby! They set out to have a child together, but they didn’t expect it to happen quite as fast as it did…. …especially with the finances of the house in flux. Four years ago when my former husband and I divorced and I bought out his half of the house two women put some money into the pot. At that time we were talking about selling the house and moving in a fairly short period of time, but plans changed and time passed and the money sat trapped in the equity. Understandably, the investors would like their money back, but it’s been difficult to figure out how to untangle the finances without taking on so much more debt—without myself taking on more debt, since I’m still legally the owner of the house–that rents rise beyond viable collective house rates. All of which…. …provided a moment of clarity for me. I’ve been feeling restless for a couple of months now without having any idea where the restlessness began or what its end point would be. Out of the fog of uncertainty that permeated the house I came to recognize that I am ready to step out of the small community of our house and into a larger community of Food Not Bombs, the HIVE, and my own solitary company. Mark and Jodi are having a baby, Will is leaving in August to go back to college to study music, and I’m going to find a place of my own. Before the summer is over 406 North Mendenhall Street will be on the market. This six-year experiment is coming to an end. It was an emotional meeting the Monday morning that we sat in the living room and acknowledged that one by one we had crossed off all the other options and had reduced the list to one. That one. There were some tears, some long silences, a lot of looking at the floor. And at that moment—here’s where I would have liked to have had the team of writers from Anarchy! taking notes on their legal pads, though I’m not sure they could have improved on the reality—Clement came in. He had dropped by to use the computer, but he stayed to tell us what was on his mind. He spends a good part of each day walking around writing poetry in his head and thinking; what he had been thinking about that day was reincarnation. The back door closed. More silence, but it was a different silence. “You know…” someone finally said. “What if…” someone else said. And that’s when the idea began to take shape. This time not just a collective house, but a kind of collective urban farmstead, a demonstration project of sustainability, a public/private place where people could learn and teach all the practices of sustainability from rainwater catchment and permaculture to consensus decision-making and conflict resolution. Set it up as a true non-profit from the beginning, maybe work towards creating an urban land trust, do things with kids, learn from the community. We could find land in a neighborhood—Glenwood, not too far from the HIVE, would be ideal. Fruit trees, gardens, chickens, communal kitchen, artificial wetlands. Something like the Rhizome Collective in Austin, or The Food Project in Boston. So that’s where we are right now: all over the map. Scared, hopeful, exhausted, exhilarated, full of plans and a sense of urgency, but under it all feeling as though a lock that we didn’t know was there, on a door we never noticed before, is opening up and swinging wide.